2" dissolving food rotation LabeLocker kits feature hard plastic dispenser cases filled with a full roll of each 2" dissolving day of the week label. 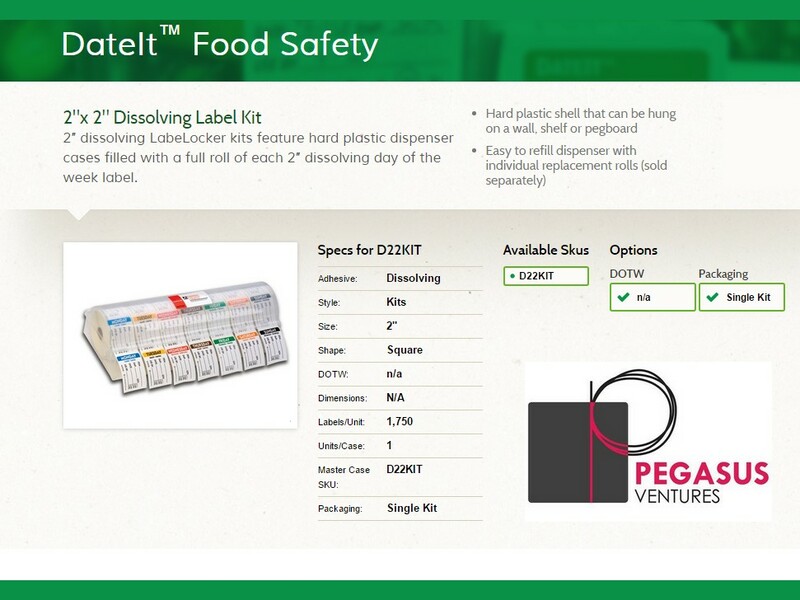 The DateIT™ Food Safety D22KIT 2" with dissolving food rotation labels LabeLocker Kits feature hard plastic dispenser cases filled with a full roll of each 1" dissolving day of the week labels comes with a hard plastic shell that can be hung on a wall, shelf or pegboard. Easy to refill dispenser with individual replacement rolls. 2″ square dissolving food rotation labels dissolve completely in water. These biodegradable labels ensure you’ll never scrape crusty tape or food rotation labels off washed containers again. 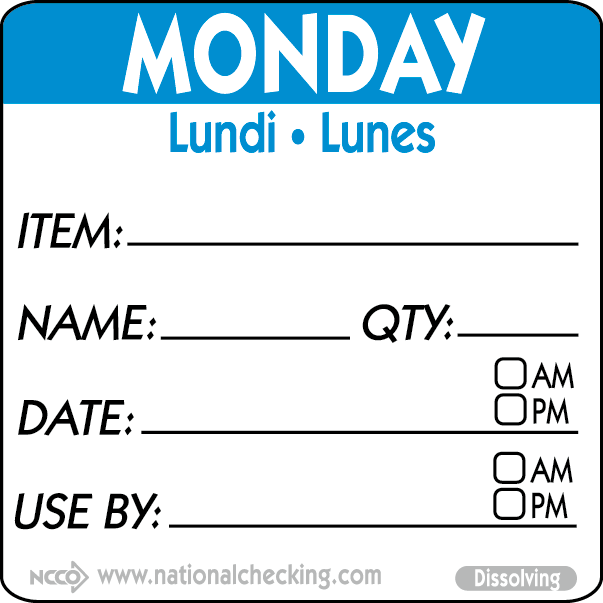 The food rotation labels found in the DateIT™ Food Safety D22KIT LABELOCKER™ Plastic Label Dispenser offer plenty of space to write the use by date with the preprinted day of the week showing the prepped day, or vice versa and the dissolving labels work best in temps range: -40°F to 176°F with a minimum application temp of 21°F when adhered above condensation line. 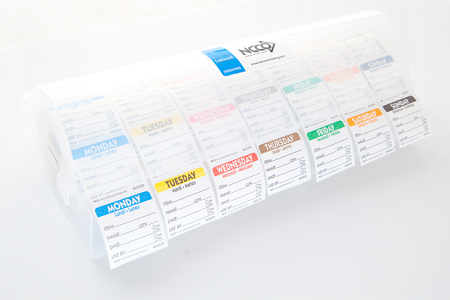 Every DateIT™ Food Safety D22KIT LABELOCKER™ comes with 1,750 labels or 250 food rotation labels for each day of the week. DateIT™ Food Safety D22KIT LABELOCKER™ Plastic Label Dispenser Kits feature hard plastic dispenser cases filled with a full roll of each 2" dissolving day of the week label distributed by Pegasus Ventures Michigan ensures food freshness is an integral part to any food safety plan, and the most inexpensive and efficient way to ensure the freshness and safety of food is a simple food safety labeling system. One of the greatest features of food rotation labels are the ease of use that saves the restaurant operator time and the DateIT™ Food Safety D22KIT LABELOCKER™ Plastic Label Dispenser Kits feature hard plastic dispenser cases filled with a full roll of each 2" biodegradable dissolving day of the week label starts your food service out right with a great tool! Instead of having a food rotation system centralized around a marker and masking tape, standardizing food rotation with color coded pre-printed labels allows every person in the kitchen to quickly and easily identify the right food at the right time. Food safety labels, like the DateIT™ Food Safety D22KIT LABELOCKER™ Plastic Label Dispenser Kits feature hard plastic dispenser cases filled with a full roll of each 2" dissolving day of the week label, offer the ability to vastly improve inventory organization in any establishment at a relatively inexpensive cost. Food rotation labels ensure health inspectors and workers that the kitchen environment is up to code and serving the freshest food possible.